Here’s a supplement to our previous post on economic growth scenarios, another way to look at the past decade. Jean-Baptiste Say was born 250 years ago, on January 5, 1767. Say translated Adam Smith into French, wrote his own *Treatise on Political Economy* in 1803, and coined the term entrepreneur. He worked at a life insurance company in England and established his own cotton spinning mill in France, employing as many as 5,000. His “Law of Markets” – later known as Say’s Law – was a foundation of classical and neoclassical economics, a contravention of Malthusian pessimism, and later a chief target of Keynesian antagonists. Peter Drucker began the first chapter of his book *Innovation and Entrepreneurship* by quoting Say. Here is Steven Kates’s book *Say’s Law and the Keynesian Revolution,* and a video of a Kates lecture on the topic. Here’s John Maynard Keynes’s book *The General Theory,* which was in significant part an attempt to refute his own clever misstatement of Say’s Law. And here is the @JBSay twitter account (me). Reasons for optimism in 2017? A new policy direction in 2017 could substantially boost the economy. Last week I commented on the 15-year IPO winter and the possibilities for a revival of public equity financing of growing firms. This $2.8-trillion “miss” translates into millions of lost job-years and stagnant incomes for most occupations in much of the country. I’ll have lots more to say about the sources of — and potential solutions to — this growth gap in the coming weeks and months. For now, we highlight these severe shortfalls to reinforce just how crucial a new growth agenda is. Tomorrow, a host of Silicon Valley firms will visit Trump Tower for a meeting with the President-elect. Last week, AT&T and Time Warner visited Capitol Hill to testify about their proposed merger. These diverse companies build lots of things, from software to networks to original content, but they also have one thing in common. Increasingly they are all vying for bigger chunks of the video market, and in the process they are creating an entirely new media universe. Too often when policymakers look at these companies, individually or in small sets, they see only what it right in front of them, rigidly defined and static, or even stereotypes of what these companies were a generation ago. But these companies — and the markets in which they play — are changing every day. Several years ago, in a report called “Life After Television,” we noted that the YouTube and Netflix phenomena were only just the most obvious and earliest manifestations of the Web video revolution. We noted that, yes, the more abundant bandwidth of cable TV and then satellite had been improving the video market for years, but that even bigger changes were coming. This process, we said, would be intense, and messy, and often exhilarating. Broadband and the Web have now super-charged all these phenomena. We enjoy far more choice and diversity, and the spectrum of quality is broader still. The producers, delivery channels, and business models for video are also multiplying (and in some cases recombining and overlapping in surprising ways). We are only in the middle of the beginning of what will be a decade-long process of sorting out the video content, creation, distribution, aggregation, user-interface, viewing, advertising, and subscription markets. Here is the graphic we used to describe, in simplified form, the overlapping activities of firms competing in the video market, often approaching from very different angles and starting points. Graphic describing simplified video value chain, circa 2014, in Life After Television. The firms pictured are still at the center of the new media tussle. But others have joined the fray, and the battlefield is constantly shifting. Facebook, for example, was not even on our 2014 graphic, but in the subsequent two years it has become a giant player in the Web video (and thus advertising) market. At the time of our report, only Comcast covered the full spectrum, from connectivity to content. But in the meantime Verizon added content via its purchases of AOL and Yahoo, and AT&T is adding content with its Time Warner acquisition. Netflix and Amazon have only expanded as award-winning production houses of original content. Google and Apple, of course, continue to approach video with distinct business models — Google via advertising and the Web, Apple via a la carte and apps — but each remains a powerful player. And we are still only, perhaps, at the end of the beginning of this media reshuffling. This new media world is emblematic of an even larger phenomenon of dynamic competition across the technology landscape. I described this even wider playing field in another report called “Digital Dynamism: Competition in the Internet Ecosystem,” which illustrated the multidimensionality of the market. This new market was characterized by intensive innovation, product differentiation, and cascades of competitive and complementary products and services. The dynamism of the Internet ecosystem is its chief virtue. Infrastructure, services, and content are produced by an ever wider array of firms and platforms in overlapping and constantly shifting markets. The simple, integrated telephone network, segregated entertainment networks, and early tiered Internet still exist, but have now been eclipsed by a far larger, more powerful phenomenon. A new, horizontal, hyperconnected ecosystem has emerged. It is characterized by large investments, rapid innovation, and extreme product differentiation. There is both more competition, and more complementarity, than ever before. Which is why policymakers or pundits who are quick to shout “monopoly” in any of these contexts is almost surely wrong. Yes, some of these firms have large market shares in small portions of this overall digital world, but these share are often gained through real innovation, and even then they are often fleeting. These markets are way too fluid to assume anyone has a lock on any part of it, let alone a dominant position overall. So a merger of, say, AT&T and Time Warner, might to some look like “consolidation,” when in fact it potentially provides highly innovative and beneficial new competition in the online advertising business, where at the moment Google and Facebook are the biggest players. It’s way too early to predict where all this will end up, let alone to dictate and end game. On Wednesday, the Senate Antitrust Subcommittee will take up AT&T’s pending acquisition of Time Warner (the owner of HBO and TBS, not the cable company). Congress has no direct role in merger approval, but the hearing will no doubt highlight the arguments for and against the merger that the Department of Justice, and possibly the Federal Communications Commission (FCC), will hear next year. As odd as it may sound, I think the AT&T-TWX alliance is chiefly a 5G wireless infrastructure story. Time Warner, combined with DirecTV, will provide a huge amount of popular video content to act as a killer app for a new nationwide wireless infrastructure, not only delivering video to proliferating mobile devices but also competing with cable for residential TV and broadband subscribers. While video may be the killer app, this 5G wireless network will also serve as the strategic platform for most of the rest of the economy, from connected and autonomous cars to health care to the retail and industrial Internet of Things (IoT). For an incoming administration focused on infrastructure and reviving the lagging sectors of our economy, 5G is attractive. It offers not only tens of billions of dollars of direct infrastructure investment and jobs (at no cost to taxpayers) but also a means to boost productivity and incomes in industries that so far have been left out of the information revolution. Much of the opposition to the deal takes the vague and familiar form of big-is-bad. Among specific critiques of the deal, however, the most prominent is opposition to “zero rating.” Zero rating, or free data, is the practice of content firms paying for the data consumption of their viewers or listeners. Free data comes in different forms — some are like 1-800 toll-free numbers, other exempt sponsored content from data limits. Critics worry that AT&T, like Comcast before it, will use zero rating to favor some content over other content, and the outgoing FCC is trying to pick a fight. Last week, AT&T launched its new DirecTV Now service, which delivers bundles of cable-like video channels over the internet and which won’t count against users’ AT&T data limits. You’d think the FCC would be thrilled with this new, attractively-priced, competitive offering. Yet the FCC promptly hit AT&T (and Verizon, which has a similar service) with letters skeptical of their free data programs. The FCC’s attack on free data is probably legally indefensible, but it is also economically unsound. Opposition to zero rating is based on zero-sum fallacies, where one party’s gain necessarily means another party’s loss. If HBO or ESPN or Netflix or NBC or Spotify subsidize your consumption of their content, then you or other content firms must somehow lose, or so the theory goes. But the opposite is true. What if most everyone can get more of what they want? This is the way innovation works. In competitive markets like mobile broadband and digital content, free data is additive. It’s positive-sum. By allowing content firms to contribute to the economic equation where they see a benefit, it promotes the consumption of more total data by consumers, their ability to access more third-party non-zero-rated content, and the ability to build faster networks. It’s a win-win-win for consumers, ISPs, and content providers. Free data is likely to be a widely used business model for connected cars, health care and educational apps, and the Internet of Things. And so proscribing the use of this commonplace business model would not only hurt digital content but also the emerging apps and services we are planning to build using 5G networks. There’s lots more to say on these topics, but opposing a merger based on refusing free data for consumers is unlikely to be a winning argument. Google Fiber pull-back shows broadband is difficult. But 5G will make it much easier. Google Fiber is halting its rollout in 10 cities and laying off staff as its chief executive Craig Barratt steps down, dealing a major setback to the Internet giant’s ambitions of blanketing the nation in super-speedy Internet. Several years ago, Google Fiber was the darling of both Silicon Valley and most of Washington’s tech policy wonks. It was supposed to bring “gigabit speeds” to supposedly woefully underserved American consumers. The facts were more complicated. It turned out existing broadband firms were already investing hundreds of billions of dollars in wired and wireless broadband, and the U.S. topped the world rankings in the most important measures of Internet performance. Google Fiber’s demise, or pause, or whatever it turns out to be, shows that large scale infrastructure projects are hard. And expensive. And competitive. Especially when deploying fast-changing technologies. And especially when the costs of regulation are rising. Which points to an ironic facet of this news. At the Wall Street Journal‘s annual WSJ.D conference yesterday, AT&T CEO Randall Stephenson plainly acknowledged Google’s victory in the biggest tech policy debate of the last 15 years: “On neutrality. You guys from Google, you won. It’s done.” Yet the sad irony is that Google’s “win” on policy — the imposition in 2015 of old and voluminous monopoly telephone rules onto modern broadband — made Google’s own broadband deployment efforts even more difficult. We long said that Title II regulation would make broadband less competitive, and Google’s exit of the business is evidence of this effect. What regulation taketh in terms of innovation and investment, however, technology can in some significant portion often give back. Enter 5G wireless. Fifth generation wireless, or 5G, is a suite of technologies that will be the foundation of the Internet, and of most of the economy, for the next 20 years. It includes more advanced air interface protocols, new “software defined” network architectures, use of huge new swaths of high-frequency spectrum, and deployment of millions of small cells, all of which will dramatically expand coverage and capacity. But not just for mobile. 5G will also power connected cars and the Internet of Things. It could even become a real competitive offering for fixed residential broadband, delivering both interactive Web video and TV-like high-definition video the way only cable and fiber-to-the-home do today. A key component of 5G is the opening up of huge amounts of spectrum, at far higher frequencies than are used today for mobile wireless. Today’s mobile devices send and receive signals mostly in the 1-2 gigahertz range. Most Wi-Fi signals are in the 2.4 and 5 GHz bands. But 5G will make use of bands in the 20, 30, and even 70 GHz range. These higher frequencies contain large blocks of mostly unused bandwidth that can transmit more data far faster than today’s mobile cell networks. In a neighborhood setting, fiber-connected small cells could blanket not only hundreds of home receivers but also thousands of mobile devices. But bringing fiber to the neighborhood is far more cost-effective than taking it all the way into the home. 5G could be powerful enough to deliver a video service on par with cable TV/broadband. Satellite will still have an important role for high definition TV, but 5G can overcome satellite’s limited capacity for interactivity (given the latency incurred over the 46,000-mile round trip to space and back). This new competitive broadband service might be enough to push the AT&T-TW partnership over the line with regulators. And it should also serve as a warning to future market meddlers at the FCC: technology is almost always far more powerful, and pro-consumer, than clever attempts to shape yesterday’s markets. 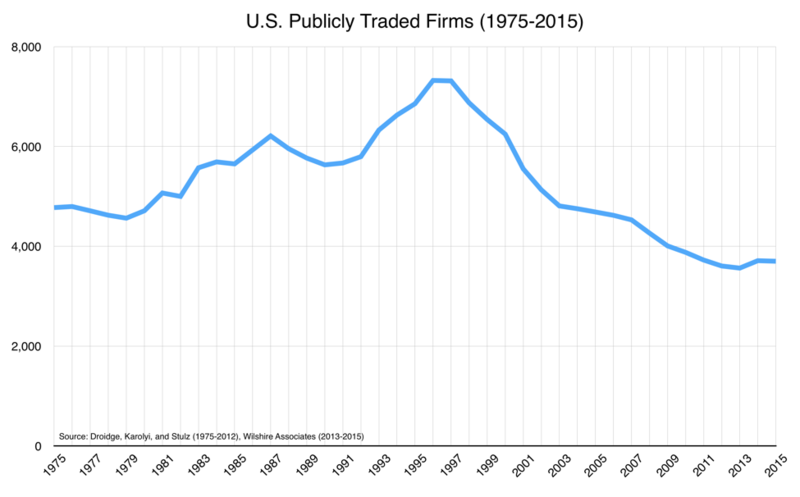 What’s behind the stunning decline in publicly traded U.S. firms? An underreported story of the last two decades is the sharp decline in the number of publicly traded U.S. firms. In 1996, U.S. stock markets boasted 7,322 listed firms. By 2015, however, that number had dropped by more than half, to 3,200. If we adjust for population, the U.S. had 2.2 public firms per hundred thousand people in 1975, but today that number has fallen to 1.1 public firms per hundred thousand people. The peak in 1996 was 2.7 public firms per hundred thousand. There’s been an initial public offering (IPO) winter for the last 15 years. We know that Sarbanes-Oxley, the set of post-Enron financial regulations enacted in 2002, substantially boosted compliance burdens for public companies and, at the margin, discouraged listing publicly. But the drop in total public listings began before Sarbox and was in fact coincident with the late-1990s boom of technology IPOs. The mid-1990s peak of tech IPOs almost assuredly skews the chart, and yet the U.S. still has fewer public firms today than it did 40 years ago. The mid-1990s peak of tech IPOs almost assuredly skews the chart, and yet the U.S. still has fewer public firms today than it did 40 years ago. Over the past few decades, the rate of new businesses formed in the U.S. has fallen. Is the plunge in the number of public firms partly a result of the slowing rate of net business starts? Or perhaps just the reverse: Is reduced new firm formation a function of a less healthy public equity market? Does this represent a benign shift in the way companies are financed? In other words, are private markets – bank loans, venture capital, private equity – now so large and sophisticated that they can replace and compensate for shrinking public markets? Or are weaker public markets starving businesses of funding? Is the drop a function of slower economic growth overall? Or is it a cause of slower growth? In a similar vein, is the drop a cause or effect of the recent productivity plunge? Are there a significant number of foreign firms that used to be listed on U.S. stock markets now listed on their home markets? Is the reduced number of public firms a result of a higher rate of mergers and acquisitions (M&A)? And if so, is higher M&A activity a secular shift in industrial organization? Or is it a response to policies that encourage M&A and discourage firm independence? Does the knowledge economy, which rewards network effects and scale economies, tend toward a smaller number of winner-take-all firms? In a distinct but related phenomenon, might modern communications tools allow firms to more efficiently integrate than was previously possible? Or might these network and scale effects produce both winner-take-all mega-firms (Apple, Google) and also lots of complementary firms (start-up app developers, graphic designers, etc. ), with the problem lying elsewhere? Are private firms better at investing and innovating for the long term, given the regulatory incentives faced by public firms and investors to focus on the short term? (Sarbox and other “fair disclosure” [FD] rules, for example, are designed to increase transparency and provide a level information playing field for all investors. But in practice the FD paradigm concentrates information releases into discrete quarterly announcements. It thus may contribute to the dreaded “short-termism” – a myopic focus on next month’s earnings rather than long term innovation. Because real information is less available, it also encourages short-term quantitative computer trading over fundamental analysis and long-term investing.) If so, private firms may be a solution to the information desert afflicting public markets. Is the public firm reduction concentrated in particular industries – manufacturing, retail, health care, finance, technology, etc.? Or is it spread evenly across industries? Does globalization mean that former U.S. firms now spread around the world just aren’t replaced by domestic firms? The timing with the rise of China suggests perhaps this is a factor. And yet the world economy is not zero sum. Why couldn’t globalization, which allows for more specialization and growth, allow new types of American firms to replace the ones that “moved” abroad? Is the tax code an important factor? For example, publicly traded firms fell after the 1986 tax reform (after which much income reporting was shifted away from corporate income and toward individual income), rose after the 1993 tax increase, and then fell again after the 1997 capital gains tax reduction. In addition, the U.S. corporate tax rate of 35% has, over time, become the highest in the developed world. We know U.S. firms keep several trillion dollars in retained earnings overseas because they can’t bring it home. Can corporate inversions, in which U.S. firms move abroad, at least notionally, often to escape punitive taxes, explain a significant part of the phenomenon? How do fewer public firms affect R&D investment and employment? Is the fall in the labor force participation rate related? What does the investment environment look like in a world of reduced public equity vehicles? How do equity markets behave with fewer domestic public firms but many more investors? How does this change affect individual retail investors, who don’t have much access to private markets, versus sophisticated investors who enjoy many more options, such as venture capital, private equity, M&A, and private credit? A new report from the White House Council of Economic Advisors picks up this theme and laments higher firm concentration and less competition in the U.S. economy. The CEA says more rigorous antitrust enforcement and agency specific regulation could help promote competition. And yet the CEA report ignores perhaps the most important factor in falling competition: regulation itself. Dodd-Frank has made the big banks bigger and reduced the number of small community banks. The Affordable Care Act (ACA) accelerated the consolidation of hospitals, clinics, and other health care providers into massive health care systems. The ACA has also reduced product and supplier choice, and boosted premiums, in the health insurance market. Washington is trying its best to shut down private colleges and other non-traditional educational offerings. Its “war on coal” has been successful at killing coal companies and thus reducing energy competition. And the Federal Communications Commission’s new Title II net neutrality rules – which were designed for a monopoly industry! – are likely to discourage new entrants into the wired and wireless broadband arena. I could go on. If Washington had set out to frustrate entrepreneurship, reduce competition, and discourage public equity financing, it would have enacted policies much like the ones of the last 15 years. The entire apparatus of regulation and taxation, taken as a whole, has slowed the economy and thus the diminished the possibilities for smaller competitive firms to get started, expand, and perhaps go public. No one knows what the “correct” number of public firms is. But we’d get a much better picture of that number by freeing competitors to compete and allowing the market to fund firms with the best mix of financing. This post originally appeared at the U.S. Chamber Foundation blog – https://www.uschamberfoundation.org/blog/post/what-s-cause-and-effect-plummeting-public-firms. As a native Hoosier, born in La Porte, now living in Zionsville, I feel a responsibility to share my views on the upcoming primary between Ted Cruz and Donald Trump. The nation is at a crucial inflection point – on the economy, the culture, and foreign affairs. As for the Republican Party, it will be running against a very weak Democratic candidate, and it has a historic opportunity to change the trajectory of the economy and right the dysfunction in Washington. If you are a Republican, or an independent or Democrat who’s dissatisfied with the nation’s current path, this is a big decision. The bottom line is that Ted Cruz would likely win in the fall, while Donald Trump would almost certainly lose in a historic wipeout. Even if Trump were to win, however, he would continue, not revise, Washington’s harmful policy path. 1. If Indiana votes for Cruz, the nomination will be decided at the Cleveland convention in July. In that scenario, Cruz likely wins the nomination – and likely wins in November. Trump is a historically unpopular candidate beyond his narrow band of supporters. He is today losing to Hillary Clinton in Utah – UTAH! – the reddest of red states. Even his home-state New York victory was unimpressive. Hillary Clinton and Bernie Sanders each got more votes last week in New York than did Trump. Ted Cruz got more votes in Wisconsin than Trump got in giant New York. The idea that Trump puts New York and other blue states in play is thus silly. And he could easily lose traditionally Republican states – a red/blue wipeout. Voters who want to win in the fall should not succumb to the false idea that this nomination is over. Far from it. 2. Cruz has the best pro-growth economic agenda in decades (watch this interview on CNBC). The U.S. economy is stagnating under the weight of heavy taxation and regulation and misguided monetary policy. Cruz’s two chief priorities are (1) replacing the current abominable tax code with a simple flat tax and (2) repealing Obamacare and replacing it with a health system that’s personal, portable, innovative, and affordable – one that’s better for patients and doctors, not for bureaucrats. Combined with a dramatic shrinking of the regulatory state and a sane monetary policy, Cruz’s agenda would likely unleash waves of growth similar to, or even surpassing, the two decade boom of the 1980s and ’90s. 3. Cruz is razor sharp and principled and has effectively challenged Washington’s run-away spending and regulation. He’s selected an equally sharp running mate in Carly Fiorina, a technology executive who understands the economy, is a terrific communicator, and offers a bright and effective contrast with the Democratic nominee. 5. Some say Trump is a good businessman, but he’s a good businessman in the sense that Kim Kardashian is a good businesswoman. They are geniuses at grabbing attention with ridiculous and prurient stunts and turning celebrity into dollars. But celebrity is not leadership. Attention-grabbing stunts do not unite people to do big and important things. Any president by definition already has the world’s attention. It’s what you DO with that attention that matters. And Donald Trump has no clue what to do. 6. Voters should not reward dangerously juvenile behavior. Donald Trump insults women, minorities, and disabled people. When challenged, he calls people names and makes fun of their appearances. He rambles on about personalities and inane topics. Why? Because he has no clue about anything of substance. He dissembles (lies) almost constantly – pathologically, in fact. To the extent he can form a declarative sentence, he’ll switch positions three times in five minutes, and does so day after day. He won’t debate on substance because he knows he’ll get clobbered. Most politicians are of course ambitious and self-involved. But the best among them at least aspire to do important things. For Trump, he is that important thing. (For Cruz, surely an ambitious person, those things are reviving the economy, cleansing a corrupt Washington, D.C., and restoring the Constitution.) For Trump, there is nothing beyond himself. His entire life is an exercise in ego inflation. This is Trump’s ultimate self-aggrandizing confidence game. He’s trying to fool people into giving him more fame than ever. Trump is a vile, vain, insubstantial, insecure, dishonest, divisive, dangerously ignorant con artist. 7. Some tactical considerations. If you are interested in winning in the fall, vote Cruz. If you don’t like Trump and think you like John Kasich, I’d suggest you should still vote Cruz. Only two people can win the GOP nomination – Cruz or Trump. A vote for Kasich is thus a vote for Trump. Let’s finish on a happy note. Despite the bizarre and frustrating election season, the fact is we still have a very good shot to right the American ship . . . If Indiana does the right thing on Tuesday. ¹ I corrected this description to big government “progressive” because of Trump’s authoritarian views on free speech, for example, and other Constitutional and natural liberties. ** UPDATE: This story from Tuesday, May 3 – “Trump accuses Cruz’s father of helping JFK’s assassin” – reinforces my point about the vast gulf between Donald Trump and reality. He is, as I wrote above, pathological. Where a design patent is applied to only a component of a product, should an award of infringer’s profits be limited to those profits attributable to the component? This is good news. It means the Court recognizes patent law from the 1800s often does not work in the modern high-tech economy. The Court can help clarify the law so we get more real innovation and less clever, predatory litigation. The patent reformation continues. We wrote about the case here: Will Apple-Samsung Case Help Clarify Patent Law? 1. Celebrity – I think it’s hard to overstate how important fame is. Most politicians try to spread their names with commercials, town hall meetings, and parades, even as they are taking tough votes that diminish their popularity with half the electorate. Donald Trump, on the other hand, spent 30 years in the public eye and the last 10 years on one of TV’s most-watched shows. Tens of millions of people, many with no connection to politics, got to know him on his terms – and they liked him. He then leveraged his celebrity into a reported $2 billion worth of free media over the last year, which was nearly twice the total of all other GOP candidates combined. How’s Bobby Jindal (who?) supposed to compete with that? Should companies pay damages for invalid patents? Then on Friday, in a separate case, another court did in fact invalidate two of the many patents in question, tossing out a May 2014 verdict that had awarded Apple $120 million. The U.S. Federal Circuit Court of Appeals dismantled a San Jose jury’s findings in the second trial between the two rivals, essentially concluding that the technology at the heart of Apple’s lawsuit was so obvious that Samsung could not be punished for incorporating it into its smartphones. The appeals court added salt to Apple’s wound by upholding a $158,000 judgment against the Cupertino company for infringing a Samsung tech patent involving camera features. To most casual observers, paying damages for patents that no longer exist and should never have been granted might seem wrong. Denying jurors the knowledge that the patents no longer exist may also seem odd and unfair. But this is patent law, and over the last few decades common sense hasn’t always applied. We thus got an explosion of patents issued for questionable “inventions,” especially for obvious software code, business practices, and even graphic designs. We also suffered a corresponding explosion of patent litigation. Fortunately, common sense has in the past few years been making something of a comeback. The Supreme Court has reined in some of the worst abuses of trolls and the over-issuance of software patents. The Apple-Samsung cases highlight some of the remaining relics of patent law left over from a pre-digital world. Such as how to handle products that contain tens of thousands of pieces of intellectual property. Or, as in this case, how to clean up after several decades of over-issuance of questionable IP. If you were a juror, would you want to know if the IP at the heart of the case was highly suspect or nonexistent? The law in this realm may be complicated. But as a matter of right and wrong, it seems pretty straight forward. Lots of people think innovation is over. Robert Gordon, the author of a grand new book called The Rise and Fall of American Growth, thinks the Information Age may be finished. We disagree. Great Stagnation? Or Technology Renaissance? On Thursday, my colleagues in the American Enterprise Institute’s technology program offered views on “Cyberspace policy at home and abroad,” covering the increasingly contentious realms of hacking, encryption, IP, and global Internet governance and the domestic effects of FCC regulation. I spoke for 10 minutes on technology’s broader impact on the economy and addressed the Great Stagnation question. Has a four-decade dearth of technology caused slow growth and inequality, with more disappointment to come? Or could better policy quickly encourage new bursts of innovation and resurgent economic growth? Watch here (with my segment beginning at 3:20:30, if it doesn’t jump there automatically). Here’s a longer talk covering many of the same topics, from Purdue’s Dawn or Doom 2 tech conference in September. What does your perfect tax code look like? Number one, it should start out on the first dollar you earn. Then take all federal taxes, (except the sin taxes, which are there to discourage behavior not collect revenue) – I’m talking payroll taxes, income taxes, corporate profits taxes, all federal excise taxes, tariffs, telecom taxes – get rid of them all. And have two taxes. One on business value added. And one on personal unadjusted gross income. Why do you like a value added tax? Because it’s got a huge tax base. And it’s all value added. You want to tax the value added to the GDP because that’s what you’re getting the resource base out of. You want to tax both unadjusted gross income and business value added because that way you get the whole GDP twice, so you can have half the rate. What’s the rationale for that? If you beat a dog, it’s gonna run, but you don’t know which direction. If you feed a dog, you know where it will be. Taxes are like that. People will do all they can to avoid paying taxes. Evasion, avoidance, underground economy, tax shelters, etc. Going out of work. So the theory behind the flat tax is you want the lowest possible rate on the broadest possible base. By having the lowest base, you provide the fewest incentives to evade, avoid or otherwise not report taxable income. Isn’t there double taxation involved? Oh, there is. But it’s double taxation of everything the same. There are no distortions. You can tax GDP at, what is it today, 22 percent of GDP. Or you can tax it at 11 percent at the individual level and 11 percent at the production level. I think it makes a lot of sense to tax 11 percent of each because you make the base that much bigger and the rate that much smaller. If this looks like the tax reform plan of presidential candidate Sen. Ted Cruz, that’s be cause it basically is. Cruz calls the value added portion of his plan a business flat tax and even referred to Laffer’s support for his plan in last week’s debate. Other candidates, however, have attacked this plan as a “VAT” – a value added tax. They assert that this dreaded three letter tax is an obvious menace of high taxation and big government. But why do they say this? Do they really think that Laffer, the economist most widely associated with pro-growth tax policy, and Cruz, a fierce advocate for taxpayers, want to over-tax the U.S. economy? Is It Like A Retail Sales Tax? VATs are a key reason European taxation and government is so large. It’s true that many European nations employ VATs, but these sales taxes are almost uniformly imposed on top of payroll taxes, corporate taxes, and progressive income taxes. They are not a replacement for these taxes but an addition to these taxes. Laffer’s outline and Cruz’s plan, however, use the business flat tax and the personal flat tax to replace the current tax code, not to augment it. Conservatives have been warning against European style VATs for decades. Why would we go down this road? Again, the key argument against Euro style VATs was that American liberals have wanted for a long time to boost taxation and the size of government, and adding a VAT on top of the current tax code has been one Democratic idea to accomplish this. Conservatives were and are correct to argue against this additional layer of taxation. The Tax Foundation analysis says the Cruz plan would boost economic growth without increasing the tax burden (and in many important ways, reducing the tax burden) – just the opposite of the European experience. Which gets us to the next argument – that VATs raise too much money. It’s true that economists of all persuasions think VATs are efficient methods to raise revenue, which conservatives usually say is the purpose of the tax code. Not social engineering, not redistribution. Laffer’s explanation above makes the point: the lowest possible rates on the largest possible economic base, which will minimize distortions, disincentives, unfairness, and noncompliance. One of the foundational insights of supply-side economics and the Reagan economic revival was that some taxes are better than others – that tax complexity and high rates can impose large costs on the economy relative to the revenue they collect, and that we can encourage greater economic activity and collect necessary revenues with a more efficient tax code. An efficient tax just means we can enjoy lower rates and less interference in the economy. Ah, critics say, yes, but VATs tend to hide the cost of government. True, VATs don’t appear as deductions from your paycheck, nor would the business flat tax. But neither do corporate income taxes appear on your paycheck, nor, for most people, do the high-rate income taxes that pay for a huge proportion of the nation’s total tax take. Taxes in the U.S. today don’t reflect the true cost of government for many voters. Let’s give future voters a little more credit. They would quickly figure out that the business flat tax rates are built into the prices of goods and services and affect wages, and would vote accordingly. (The Cruz plan even says that firms would pay the tax quarterly and report the figures to their employees and shareholders, making it transparent.) In fact, one could argue that a low-rate-broad-base tax would better align voters with good economic policy. In the current highly progressive system in which the cost of government is invisible to many, half(+1) the population can essentially vote to tax the other half(-1). With a flat tax’s broader base and single rate, on the other hand, the costs would be more apparent, less unfairly and arbitrarily distributed, and a substantial majority of voters would be likely to oppose tax rate increases. The Cruz plan would still protect low-income Americans with a larger standard deduction and, they say, an improved EITC. Yes, yes, yes, but the real threat is that future politicians could raise the VAT rate without people noticing. Politicians have already proved willing and adept at raising (and complicating) today’s taxes! I understand the theory behind this line of argument, but I just don’t buy it. Again, I think most people would understand that voting to increase the flat tax rate is voting to tax themselves. A further irony: the very critics who warn that future politicians will raise the rates in Cruz’s plan themselves support a tax plan with a corporate tax rate nearly twice as high and a personal income tax rate more than three times as high. One could say their favored tax code thus enshrines from the outset what they warn against as a mere possibility for their opponent’s plan. All that said, yes, I’d love to see some additional protections so that any new and improved tax system would be difficult to undo. Now, one argument I have not heard from critics but that I can imagine is this: Because a flat tax puts everyone basically in the same boat, and better aligns the incentives of all taxpayers/voters, taxes as a political issue may lose their saliency. Presumably, a large and crucial part of the Republican coalition is based upon the group of voters that pays an overwhelming portion of all taxes. Might some anti-tax advocates think inefficient taxes that gouge some taxpayers are good for generating anti-tax voting incentives and holding together the political coalition? With less of a tax split, would this clear cut issue go away, while the parties realign based on other non-tax issues? I have no idea, am no political expert, and am just speculating. The fact is that the tax proposals of many of the GOP presidential candidates would all improve the tax code and the U.S. economy. I think the Laffer/Cruz proposal is perhaps the most attractive option among many good plans. For good summaries, detailed analyses, and comparisons of the candidates’ plans, see the Tax Foundation. Marginal Revolution University has a good new short video on why economic growth is so important . . .
It’s difficult to overstate just how panicked the world was over oil prices a decade ago — stratospherically high oil prices. We were, most policy makers and economists believed, in an energy crisis — the result of a desperate shortage of petroleum that could only be solved with cellulosic ethanol and windmills. During this “energy crisis” of 2006, we wrote the following Wall Street Journal commentary, hoping to calm fears of peak oil and other such nonsense that often accompanies big price swings. We said oil prices likely would recede. We said vast stores of oil, especially in shale, were about to be found and extracted. We said alternative energy schemes in part justified by high oil prices were a bad idea. We also said a big financial disruption was likely. The macro environment is very different today — prices are low instead of high; the dollar strong instead of weak. In fact, we’ve been telling clients for the last year that today’s environment looks much like the late 1990s: a strong dollar, plummeting energy and commodity prices, soaring prices for abstract technology firms like Internets and bio-techs, and trouble in emerging markets. We reprint this column as a reminder of the economic fundamentals…and energy’s abundance. Nigerian pipeline explosions, Chinese demand, Arab angst, Venezuelan volatility, peak oil and a Putin premium: These are the usual explanations for high petroleum prices. But our discussion of the “energy crisis” has ignored the elephant in the barrel — monetary policy. Today, high oil prices are the backdrop for Middle Eastern chaos and calls for bad energy policy. It was much the same in the 1970s, when high prices yielded similar violence against our fellow man and against economics. This is no coincidence. A weak dollar is the culprit, now as then. When the Yom Kippur war was launched in October 1973, the price of oil had been rising for two years. For decades, oil’s price had been remarkably stable, like the prices of most other goods. But in 1971 Richard Nixon broke the dollar’s links both to gold and to key foreign currencies. Bretton Woods — and the dollar — collapsed, and a decade-long inflation began. By July 1973, gold had deviated from its long-time price of $35 per ounce and soared to $120. Oil also responded quickly to dollar weakness and doubled in price by the early autumn. The Mideast nations complained that the Western oil companies were accumulating massive “windfall profits.” Having negotiated agreements in the previous environment of price stability, the Arabs and Persians were stuck with much lower prices and royalty payments. You know the rest of the decade’s news: embargoes, gas lines, inflation, wage and price controls, hostages. Today, commodity prices across the board, from coffee to carbon fiber, remain near 25-year highs. High oil prices are not a unique phenomenon, but just another commodity whose price is determined primarily by the value of the dollar. Expensive oil isn’t exclusively a monetary event, of course: Risk and demand matter, too. But in comparing oil to other commodities, especially gold, we find that elevated risk and demand explains only $10-$15 of the higher oil price; $30 of the price is explained by a weak, inflationary dollar. The entity most responsible for expensive oil is thus the Fed.